It’s not easy to admit, but Sunday morning we didn’t feel enthused about driving to Karcag for Gary to preach. We both felt tired, and neither of us felt like getting out and going, but we had agreed to serve…and we do love the people. Most of all we wanted to be obedient to what God had for us that day. As we drove down the road, we also reminded each other how so often in the past negative feelings have tried to pull us down as we prepared to go to ministry events — and how many times these ended up being times when great spiritual impact and blessing took place! (We call this “coffeehouse syndrome” since we experienced this feeling of oppression pretty regularly before a particularly wonderful evening of gospel sharing at the outreach coffeehouse we had for many years.) We have an enemy that would love for us to stay home…for ministry to go by the wayside….for blessings to be missed. Looking back on the day, we can say – once again in all honesty – that we are so thankful we went in obedient service rather than giving in to feelings. The message that Gary shared was impactful for us as much as for the people there that morning (Scripture has a way of doing that!) During the service several people got up and shared encouraging testimonies, and a small group of us lingered in the building talking afterward. Pray for the Karcag church, that they will be encouraged, will grow, and that more leaders will be raised up to help in the ministries and mission points they are involved in. Some really difficult and tragic things were shared with us. Pray for the people and their families, that God will give them wisdom, would provide for their needs, and bring them through life’s trials. Pray for us and other Christian workers, for health, strength, and encouragement when times are hard. Praise God that He gives strength to go on serving even when feelings/emotions tell us to give in! Greetings from Debrecen, where we’re thankful it’s cooled down to the 80’s today…fans are still running, but we’re so thankful for the reprieve from the really brutal heat! I wanted to thank you all for praying for last week’s “Day 6” outreach event, which was a follow-up to the recent Grain Game Bible camp in Karcag. Since it was so hot, Gary switched plans from indoor teaching to outdoor lessons including water activities. The kids learned about the life of Jesus, baptism and it’s meaning, and about spiritual warfare. They paid attention to all the topics, but interestingly were most attentive to the one about spiritual warfare. Most are unchurched and still not sharing a lot of their deep thoughts, but perhaps they find it interesting to hear about the spiritual battle going on in this world all around them. We know that even at their young ages they’ve seen some of its effects! Pray that these young people will continue to go deeper in studying the Word, and will soon give their lives to the One who has already fought – and won – the battle for our souls. Please be praying with us for a follow-up event taking place this Saturday for the kids and youth that took part in the recent Grain Game 5-day Bible camp in Karcag. Gary is billing this event as the camp’s “Day 6″…the fun and relationships will continue, with the focus still on Bible truths experienced through interactive, creative demonstrations. This event is not only a follow-up to the camp, but will also serve to connect these kids to ministries that take place during the school year. 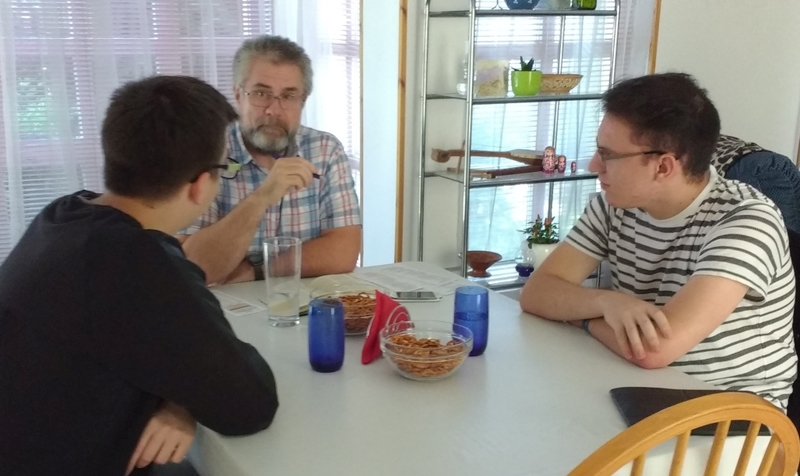 Pray for Gary as he plans and presents the program, that the teachings will connect with where the kids are spiritually and be very clear in Hungarian. Ask that the Holy Spirit will soften hearts and open spiritual eyes to Bible truths. Pray that the young people and their families will be drawn to faith in Christ and get involved with discipleship and service in the local church and community. Praise God for every opportunity we have to get Bibles into the hands of those who don’t have one! A kids’ Bible camp is going on this week in partnership with The Grain Game and the Baptist church in Karcag, Hungary, and today the kids will be receiving their very own Bible to take home. Pray with us for each child and each family that will after today have a Bible in their home. Of course, some may already have one….although many people in this area have told us that they only have a very old family Bible; the paper has become so brittle that you can’t turn the pages without causing damage. Not conducive to ready or studying! Many, many people we talk with, though, tell us that they have never had a copy of the Scripture at home. Tonight there will most likely be some homes in eastern Hungary that contain a Bible…homes where last night there were none. Pray that the kids and their families will open and read these Bibles with receptive hearts, whether that happens within days, weeks or even years from now. Pray that spiritual eyes will be opened and lives changed. Last week some really cool young guys, “G” and “M,” came over to our place for dinner and for training in how to lead simple, inductive Bible studies. This is part of a partnership project with Grain Game and the Baptist church in Karcag, with the goal of providing the next step for young people as they age out of the regular Grain Game Bible camps. Praise the Lord, it was truly encouraging to see these young guys eager to learn how to serve in this way, to make a difference for good in the lives of others! Pray that the Lord will use G and M to reach many youth with the gospel, and also to pass on this training to others.